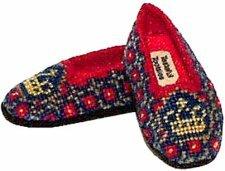 The pattern of these snazzy, yet masculine slippers, is an overall repeat of red, taupe and gold on a navy background with a gold crown on the toe. Elegant footwear, indeed, for the man of the house! This kit, perfect for any grown lady, includes not only the pattern and materials for beautiful flowered slippers but also coordinating scuffs. The colours are roses, blues and greens on the very palest pink background and pink lining. How about slippers for Mom and scuffs for Grandma or a big sister? 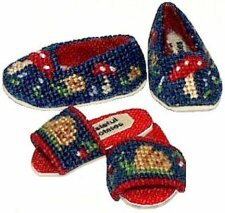 Red and beige toadstools, tan and green snails and tiny blue flowers all stitched on slippers a mere 0.5" long! Just adorable and suitable for either a little boy or girl. The included pattern for the scuffs have a snail on the top with a flower on each side.